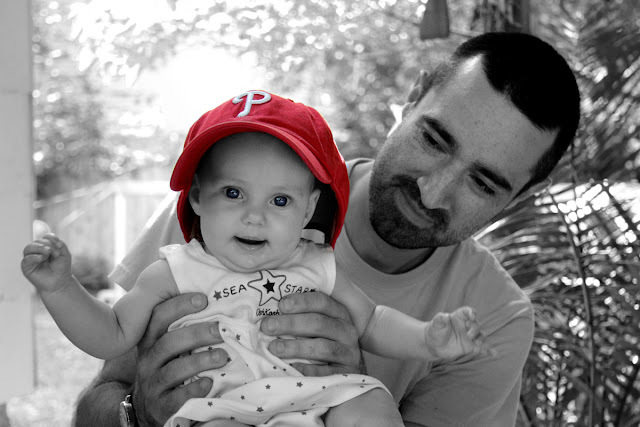 This is a photo I took of my brother, Jason, holding sweet Evangeline on the Fourth of July. The setting is in the backyard of my parents house where we hold our annual Family Fun Fair complete with custom team shirts, games, prizes and loads of snacks! I love doing color selection on photos! I would actually do it to every single one I take but that might get out of control in a short amount of time. Jason is 33 years old. He has a bachelor's degree in biology and a doctorate in geology and currently works as a professor in a prestigious college. He's also my oldest brother, who is not only intelligent but a handsome, funny, super kind and totally stand-up-has-your-back kinda guy! You may now resume all weekend activities . . . thank you and good night!